The first tool you will probably need is something for cutting, a knife of some type. The best material for a knife, in the wilderness, is going to be stone. Not just any stone will do. It must have certain qualities. It is best to use stone that is the same composition throughout. It cannot be grainy. This is so that when it is worked that the energy directed to produce a tool with it will travel equally in any direction that it is directed. The best choices for this are stones produced by volcanic activity and are glass-like. This can be quartz, however, unless acquired below the frost line, most quartz will be grainy or very flawed. This does not rule out its use by no means. It may be all you have. Rule out nothing. Find something that has the qualities you are looking for or close to it and use it, if it works! Preferably, though, you would want to acquire obsidian, flint, chert, rhyollite, jasper, chalcedony or agate, just to name a few. You may need to break open a few stones to find what you need. Looks can be deceiving. Very often the material you need is covered with an outer covering called a cortex or corticose. It may appear grainy, like limestone. Harder rocks can usually be identified by this smoother, less grainy surface. You will most likely not be using stones much larger than your fist for most tool making needs. As you pick up a stone you may notice it feels heavy for its size. This is a good indicator that it is a denser stone; a good clue that it may contain material of the quality you are looking for. You may have to remove the cortex completely to make the tool you need, you may not. If the cortex is crumbly or if it is just in the way, it should be removed. 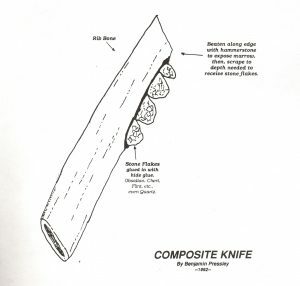 A very functional knife can be made by knowing a few simple techniques and understanding a few basic principles. 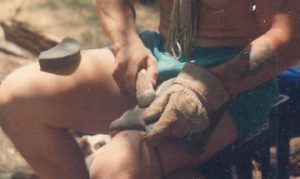 The simplest technique for producing a usable knife, after acquiring a suitable stone, has jokingly been called the “Oldowan Bashee” technology by Paul Hellweg; named after the region some of early man’s oldest artifacts, pebble choppers, were found, in the Olduvai region of East Africa. Previous to these pebble choppers stone tool technology probably involved picking up a rock and heaving it mightily against any boulder and hoping the resulting bashing would yield some usable pieces. Oldowan Bashee, get it? It does work! A good bashing of a suitable nodule will produce pieces that have at least one sharp cutting edge, suitable for cutting leather, dressing small game, even butchering a deer. Try it! You will be impressed with how many pieces will perform as cutting tools. These stone flakes were the everyday knives of stone age humans. I have butchered a deer many times with a stone flake and a hammerstone. The next stone tool technology that is equally as easy to master is called Bi-Polar Percussion or the “Nutcracker Technology”. This technique is used to split a cobble cleanly in half. Chimpanzees have been taught to do this. Select a hard, roundish stream cobble of about fist size or slightly larger, but not too large to split handily. It should also be free of cracks. Set the cobble upright on a large rock to be used as an anvil. Using a hammer stone, heavier and harder than the cobble you are splitting, strike the cobble sharply on its top. The blow must be forceful and directed straight down and through the cobble. As the force travels through the cobble it hits the anvil rock and rebounds back through the cobble splitting it cleanly in two. The result is a neatly sheared stone with lipped portions that will typically be sharp enough for cutting. I have found that this technique produces a very usable tool with even sub-standard material. Placing your cobble on an anvil seems to shatter or sever the cone of force, for there are no bulbs of force present at either end. The instant that a stone is struck on the surface the energy is transmitted into a cone radiating at about 120 degrees. Knowing this you can control how and where a stone breaks by striking a blow at the proper angle. Perhaps, as a child you’ve shot a B-B through a thick Coke bottle by placing the muzzle right against the surface of the bottom of the bottle. The results were little cones of glass that were diamonds to the child’s imagination. This is a perfect illustration of the Hertzian Cone. If you keep this in mind when working a piece of stone down you are well on your way to becoming a flintknapper. 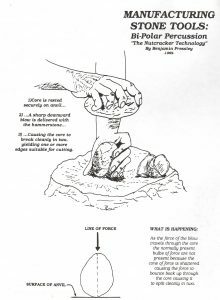 There are many other rules to follow when you get into advanced flintknapping but most are dictated by the unalterable physical law of the Hertzian Cone. Remember the line of force is a cone and not a straight line and you can produce many usable tools knowing this principle alone. The surface you deliver the blow to is also important. Known as a platform in flintknapping, it must have a particular shape or the blow will be ineffective. Study the stone and choose the area of the stone you want a flake to break off of. You can take a suitable flake and work it into other shapes once you acquire it by using other techniques or, depending on the tool you have in mind, use it as is. Once you have chosen the area you wish a flake to break off of, keeping in mind the Hertzian Cone, choose a surface that is not crumbly or fragile. This can often be remedied by abrading a crumbly edge by using a coarse stone, such as sandstone and sanding down this bad edge. The selected platform must form an angle of less than 90 degrees. This is very important. Striking a platform that is more than 90 degrees will not produce the flake you want, even if you beat it all day long. It will take a lot of experimentation, but given time you will be in control of what flakes are broken off, which can be used for knives and such, and what is left behind, which could possibly serve as a chopper for hafting onto a handle to be used as an axe. 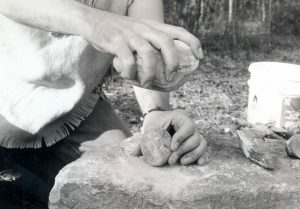 The three techniques you will use most when making stone tools are Direct Percussion, Direct Pressure and Pressure Flaking. Of course, we don’t want to forget Bi-polar Percussion and the Oldowan Bashee technology, though. Direct Percussion is striking the parent rock with another rock that is harder and somewhat abrasive so it will bite for that short instant it strikes transferring the energy of the blow. The rock you strike with is known as a hammerstone. Hammerstones should be of a size and shape that are easy to handle. Keep in mind when choosing a hammer stone, though, that the smaller it is, the more force will need to be exerted, which can mean less accuracy. And, as you can probably already tell, accuracy is very important. Very often you may use what is known as a billet made of antler or wood for a hammer. Direct Pressure is the same as Direct Percussion, except a hand, covered with a piece of leather, is held over the area where the flake is going to break off (This flake is known as a Spaul), thus directing more force to the desired area. Pressure Flaking is used after you acquire the rough flake, now called a Blank, using a blunt pointed tool such as an antler tine or sharpened wood. F lintknappers also use copper tips, bone points or antler tips mounted into the ends of wooden handles. Pressure flaking involves applying proper pressure, at the proper angle, with the tip of your tool until a flake pops off the opposite side. This technique can be used to finish an edge with, making a serrated edge. A leather pad should be used to protect the hand when doing this. You can experiment with this, but I doubt you will be able to master this technique without being shown by a teacher. There are some good books out on flintknapping that are very good. I recommend The Art of Flintknapping by D.C. Waldorf and Flintknapping: The Art of Making Stone Tools by Paul Hellweg. Primitive Tools: Making and Using Them by John and Geri McPherson is one of the best books I have read as an introduction to basic flintknapping. You may want to read their book before you read the other two recommended books. If you really want to learn more about flintknapping it is best to find a good teacher. 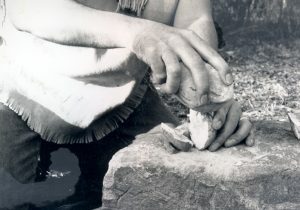 There are many other techniques involved in flintknapping. 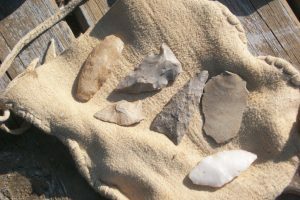 Flintknapping is a skill that you must spend many hours practicing to master. However, basic workable tools are easy to produce and easy to learn if you just know a few techniques for producing them. It makes sense to me that the everyday tools of the aborigine are probably overlooked in most archaeological digs, for they are just various stone flakes. I’ve seen some beautiful work done by flintknapping that was both beautiful and functional, but for everyday work or in a survival situation, you can’t beat a plain looking, well produced stone flake. In any of these methods you should properly support the piece being worked either in the hand or on the thigh, preferably, with a piece of leather under the piece. Properly supporting the piece can keep it from splitting in two at the unsupported end. This is particularly important when working with a long, slender piece. Pressure flaking can also be used to produce a mussel shell knife. A mussel shell knife is easy to produce and is a very usable knife. Thicker shells can be worked by direct percussion by striking the edge with a hammer stone while supporting it on the thigh or an anvil. Another way to make a shell knife is just to grind the edge sharp and smooth on an abrasive stone such as sandstone. You may find that most stone knives are usable as they are, by just holding them in your hand. However, you may, on occasion, want or need to haft them. Hafting is mounting them into a handle or in the case of projectile points mounting them into the arrow or spear shaft. There are many ways of doing this. The easiest way is to split the handle you intend to use in half. Then, carve out a place that when put together forms a notch for receiving your blade. You then must bind this back together with cordage or sinew. It is also best to glue it with hide glue or pitch before binding it. For smaller blades and projectile points you may find that just sawing a notch with a stone flake works just fine. Larry Dean Olsen (Outdoor Survival Skills) discovered a really neat trick for popping out a notch. This works particularly well with nocks for arrows and notches for projectile points. You will want to study the drawings to follow this. 1) Notches are cut on each side of the shaft where you intend it to break off as an end. The space between these notches should be as wide as you intend the finished notch for receiving the point you are mounting to be. 2) A groove is cut below the first notches to the depth you wish the finished notch to be. This is to stop the split where you wish it to stop. 3) Supporting the shaft and carefully applying pressure with your thumbs against the groove and applying counter pressure with the index fingers should cause it to split down to the groove. Do the same in the opposite direction to form a split down the other side, down to the groove. 4) Turn the shaft and applying pressure in the same manner and sort of working it back and forth, carefully, pop out the finished notch. 5) You may then finish it by smoothing down any rough areas left. You may have to trim out areas of the notch to custom fit the particular blade or point you are mounting. Then, glue and bind the blade/point in place. When making weaponry or tools you may wish to make them, or you may just find them to be, multi-functional. For example, mounting a blade into a wooden foreshaft that will slide into the end of a hollowed out spear or arrow shaft, not only serves as a projectile point, but may be removed and using the wooden foreshaft as a handle, serve as a knife. A Discoidal Knife is produced by direct percussion, keeping the Hertzian Cone in mind, except the piece you are working is struck against the hammer stone placed stationary on the ground, using it as an anvil. Doing so pops out round, flat flakes that can be used as knives. 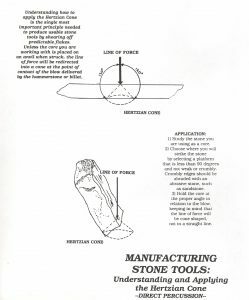 You may also use this technique to produce a chopper by choosing a flat stone close to the shape of a finished chopper or produce a blank first. You move along the ‘edge’ striking each blow at the same angle and removing flakes from the opposite side using the space left from each flake as a platform. You can produce a very usable hand axe or chopper this way. To use the chopper you do not cut into a piece of wood as you would with a steel axe by notching out a ‘V’. Instead you cut into the wood at the same angle and move around the diameter of the wood. When complete it looks much like a pencil point once you have cut through it, much as beavers do. You may use the chopper as is, held in the hand, perhaps holding it with a piece of leather to protect the hand or you may haft it into a wooden handle. More on hafting heavy objects like axes when we discuss pounding tools. 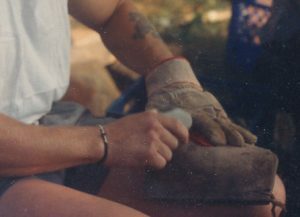 A long lasting handaxe can also be produced from greenstone by grinding and polishing an edge on various grits of sandstone or some other abrasive rock. A ground edge lasts longer, so is well worth the time to produce. If you are going to haft the axe it is a good idea to taper it towards the rear to fit into the handle. When grinding an edge do not grind it too thin because it will break easily. You do want it to be thin enough to cut well, though. Remember, this isn’t steel we are working with so don’t try to make it look like a steel axe head. 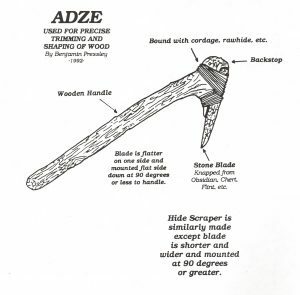 An Adze is a good tool to have for more precise trimming and shaping of wood. The blade of the adze is mounted flat on top of a handle or with a raised platform in back of the blade. It is mounted at a 90 degree or less angle to the handle. The blade is also more flat on one side with the flat side down. It is then wrapped in rawhide or cordage. Make the blade shorter and wider, mount it at 90 degrees or greater, and you have a good hide scraping tool. A composite knife of bone and stone flakes can be made from small, stone flakes and a short rib bone. Using a hammer stone pound the edge of the bone along the length of the area you intend on inserting stone flakes for an edge. Do not pound where you intend on gripping the knife. Pound it till the marrow is exposed then take a thin flake and scrape out a slot of a suitable depth to insert stone flakes, leaving enough of an edge exposed to be useful. You will need to secure these stone flakes by using hide glue or pine pitch. Hide glue is strongest. 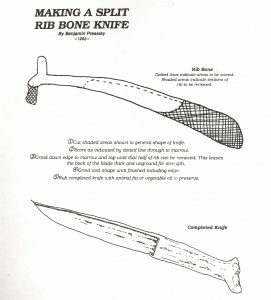 A knife can also be ground from a large rib bone of a deer, cow, buffalo, etc. First cut out the section of bone you intend on using. This can be accomplished using a stone flake and carving a groove around the diameter of the area you wish to cut. You can cut all the way through the bone doing it this way or after a fairly deep groove is made take a hammer stone and tap along the groove as you lay the bone on an anvil until it breaks. If done properly it should only break along the groove. Boiling the bone a while will sometimes soften the bone making it easier to score. 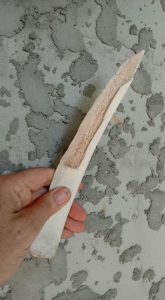 Now, using a sanding stone sand the bone into the rough shape of a knife. Allowing space for a grip, leave this area in the shape it is in. Score half-way around the guard area of the handle. Now grind along where the edge will be until you are just about to break through to marrow. Take a hammer stone and tap along the edge of the blade area all along the edge, sort of a bi-polar technique, until the bone begins to separate. Now, gently pry away and discard the half of bone on the side that has been scored at the guard of the knife. Next, grind down the blade of the knife along the edge and finish the edge with a sandstone and progressing to something smoother, like slate. Leave the back of the blade unground. It will help preserve the bone knife if you rub it down with vegetable oil or fat of some kind. 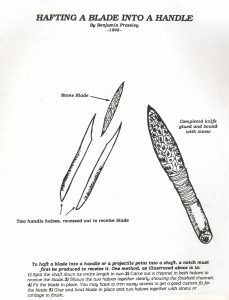 Similar to the rib bone knife, Seminole Indians made knives in this manner from the jawbone of alligators. The harder the bone used the sharper an edge you will have. Of course, harder bone is also going to take longer to wear down. Wooden knives are also not to be discounted. Australian aborigine boomerangs were sharp enough along the edges to butcher an animal with, such as the emu. A piece of River Cane cut in such a way to produce a good edge works very well. 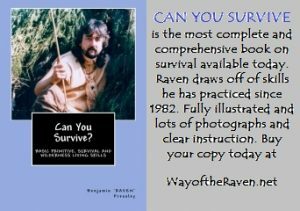 TO LEARN SO MUCH MORE BY RAVEN’S BOOK!